Happy Sunday blogger fam! I hope you have a great day and get to enjoy some sunshine. It was a pretty gloomy and rainy week here but it looks like the sun is out. I have runway practice today so I hope it doesn’t rain. 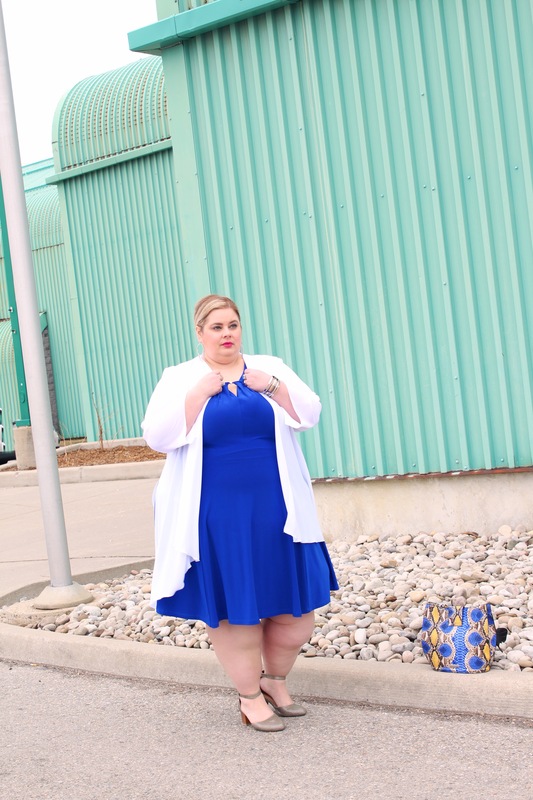 I had a chance this week to go in and visit SexyPlus Clothing so I could try on some of the latest pieces to arrive from my spring Artex collection and I loved them so of course I needed to do a blog post to show them off. And this is a two for one special where I show you two different looks. In this first look you might see something familiar and you are right I am wearing the San Antonio jacket but this time in a great ivory and blue colour palette. From my last post you all know how much I love this jacket. So when it came in 2 different colour palettes, Stef and I agreed we had to get both. This jacket has been a favourite with you guys a well so it is already almost sold out! I am wearing the 22/24 and that is the only size left in the Ivory. So if you want it you better get it while you can! This ivory and blue colour palette is perfect for spring. 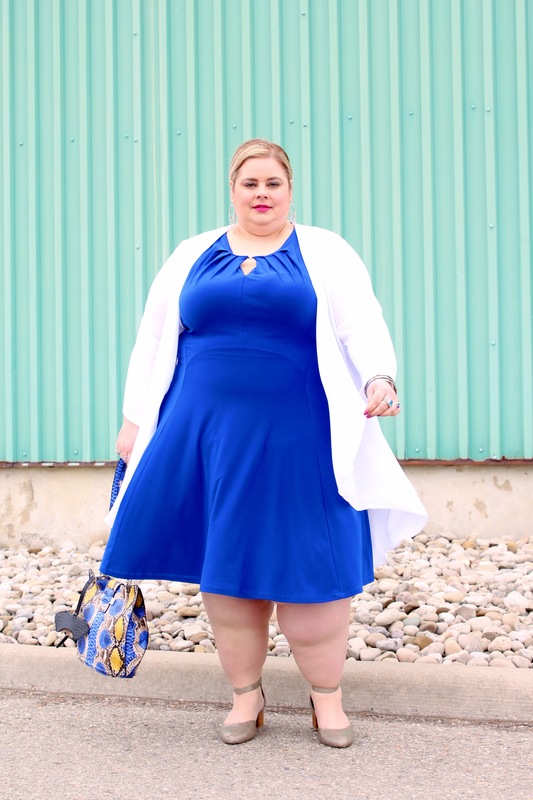 We are seeing a tonne of white this spring in plus size fashion and it’s about time! It’s crisp and refreshing and we can rock it too no matter our size. It is a great neutral and ladies I challenge you to think of it as an alternative to black. If you like to wear a jacket or a cover up, ditch the black you wear all winter long and try something white. 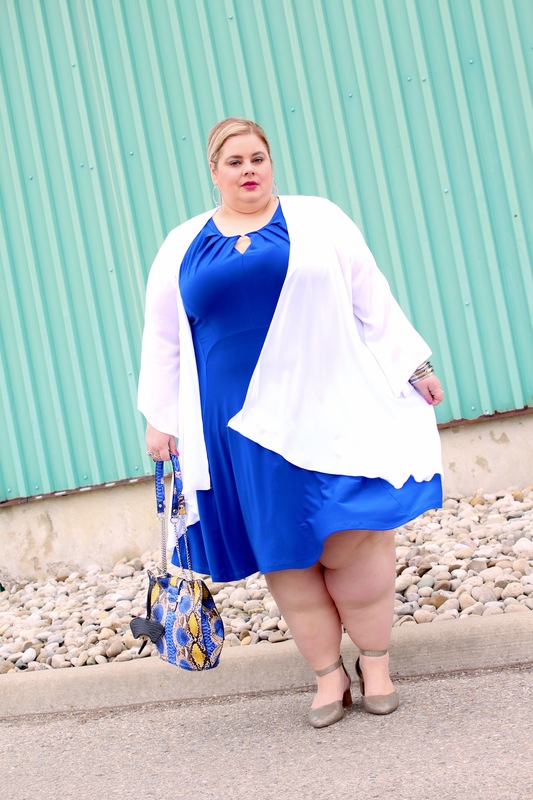 Having said that if you are not big on prints or are looking for something more classic then I recommend the Angelica Chiffon Cover that I am wearing in this second look. This piece is perfect to wear for those upcoming weddings, first communions, graduations and anniversaries. It is light weight while still providing arm coverage for those who prefer it and I love the side slits because they give the piece great movement and they are so practical for sitting down. This piece has a generous fit as I am wearing the 22/24 and the fabric is non stretch. This piece is very versatile as it would also be perfect for the office. Paired with a great sheath dress or pencil skirt and top I think it would look super chic. You could also add a belt if you want to define your waist. Ok so let’s talk dresses! We decided to choose the matching dress to the San Antonio jacket in the Ivory as I thought it would be a great choice for spring and summer. The Isla dress is made of the same great fabric as the jacket and it is also fully lined. It has great stretch to it and it is important to have a high quality fabric when wearing ivory and white dresses. There is nothing worse than being able to see through white pieces! It is a personal pet peeve of mine. I am wearing the 22/24 in this piece too. What I love about this dress is that it is such a fun piece! Besides the print it has a super cute hankerchief hem that is so fun to move in, a great Aline shape, a scoop neckline that is not too revealing and bra friendly straps, a personal fave. Now I have to show some love to the Irene dress which has to be one of my personal faves. When I tried this dress on it was like it was meant for me. I love a rich colbalt blue as it really works with my hair and skin tone and makes my eyes pop but I also think it is a pretty flattering colour for most people. 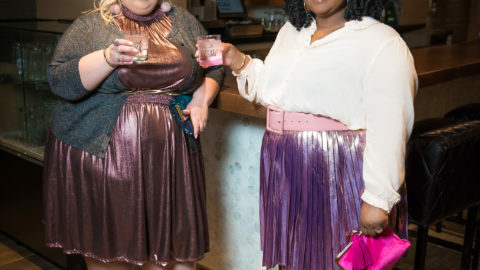 This dress is the perfect go to cocktail dress. It’s perfect fit and flare silhouette shows off all your curves and it has strategic seams that help it lay perfectly. I love the pleating detail at the neckline with the button keyhole accent that shows a little skin but not to much. Again the straps are bra friendly and I love the length. And the sizing from Artex is super consistent as I am wearing the 22/24. There are endless ways to style both of these looks, they can both be worn to the office or for a special occasion. Don’t forget that SexyPlus has a great selection of accessories to choose from so you can complete your look. I mean how adorable are these little black dress earrings? I hope you are loving the pieces that I chose for this collaboration. We tried to bring you as much variety as possible with classics styles, wardrobe staples and of course some fun unique pieces mixed in. There are still a few pieces that we are waiting on to arrive so stay tuned. They are some good ones! SexyPlus Clothing has so many great new arrivals for spring and the store just got a fresh merchandising update so be sure to stop in and visit Stefanie or if you are not local, check out the website because she ships internationally for all my babes around the world looking for fabulous plus size clothing options. Photos by Stef, owner of SexyPlus Clothing. The blue dress is really perfect for your hair and eye color, maybe I am not objective as blue is my favorite color but you look so damn cute in that dress. Lovely again – can’t quite decide which dresss I prefer – think the white one with the blue and black flower design is just in front – both look supremely good on you though! Aww, you look lovely, I especially love the one with the blue and black flowers! Where do you buy your shoes?